Aloha from Hawaii! Our annual family vacation to Hawaii is finally here! Follow on my instagram and snapchat (rachparcell) to see all of our adventures! Happy Thursday everyone!! Gorgeous look Rach, and Isla is adorable..
Isla is beyond the cutest!! I love her little smile! You look gorgeous…and so happy! Hope you and Drew and little IR are having the best time! Loving the brights!!! Isla is adorable..
I’m loving the bright colors, especially that cool bag! All of your pictures from Hawaii look beautiful, hope y’all are having a wonderful time! That cover up is so much fun! Love the colors!! I love the yellow bag and strappy sandels! Definitely wishing it was summer weather! Love the dress! I am so jealous! The resort and Island looks amazing on Instagram! Thanks Laetitia! It has been a blast so far! Obsessed with your rock stud sandals! Isla’s bathing suit is the cutest thing I’ve ever seen!! Such a cute and colorful beach time outfit! You’re looking beautiful! Mommy hood suits you so well! This post has me dreaming of warmer and tropical days! Looks amazing! That dress is stunning, Rach! I love the vibrant colors paired with that bold bag. Great swimsuit, too! Enjoy your vacation! LOVE that cover up and the swimsuit! Super jealous you’re in hawaii!! http://trendkeeper.me .. Easy Everyday Makeup Tutorial! I’m loving the bright yellow bag! Perfect for the sunny weather over there! Thanks Hayley! And oh my, she LOVES the water! Oh my gosh!! What a fun cover up! I love that tassel detail on the suit too. Aloha! Have fun! I miss Maui! so cute! Hope you have a great time, loves! I love the giant yellow bag! Adorable! And Isla is looking cute as always! That swimsuit is gorgeous! The color looks great on you. Looks like such a fun trip! I love your swimsuit! It’s so classy and chic. You’ve got me wishing it were summer already! So adorable! Love that suit! Enjoy Hawaii! What a great beach dress! Enjoy your trip, Rach! I love that suit! It is so cute! Love your outfits! Isla looks so adorable! I love that dress! Your photos are beautiful and your daughter is so adorable. Enjoy your vacation! Isla looks so happy and cute. Hope you’re having a great time in Hawaii, lovin’ all of your snaps! I LOVE this hot pink swimsuit! The cut and fit is perfect! Hope you have fun in Hawaii! So colorful! Love it. Hope you are enjoying your time! Gorgeous dress! Love the colors. Looks like you’re having an amazing vacation! Love the bathing suit and the sandals! It looks amazing! Have a lovely time there! Love your Céline bag in yellow, so beautiful and unique! Thanks so much, Ann-Louise! It’s our favorite vacation spot for sure! Everything about this entire look is amazing! All of the colors, and the YELLOW Celine! The colors all flow together so well. How you’re so lucky Hawai is amazing! Oh my, Isla has the cutest little smiles!! Loving that swim suit too! So cute!!! Love your suit! That dress is the cutest!! Love it!! Have fun in Hawaii!!! So jealous! All the bright colors are getting me pumped for spring. Have a fantastic time! Great photos and the purse is a great statement piece! That swim suit is GORGEOUS!! I am headed to Cali next month and that would be perfect! And you look so adorable with your daughter! Beautiful shots! That swimsuit is so gorgeous!! love the color combination! so bright and fun! Rachel ! I am so jealous of how tropical and amazing you look <3 That bag is still one of my favorites of yours, I want it so badly ! I hope you have an amazing vacation as well ! Beautiful photos. Love your pink swimsuit!! Gorgeous coverup & swimsuit! I love the bright colours! This coverup looks so adorable on you. Loving the bright colors! Great dress! So colourful! Perfect for the tropics. I love your bright tropical style! Aww too adorable! I hope you and your family are enjoying the sunshine!!! And I absolutely love the sandals. I love all the bright colors! such a cute baby! Love your bright yellow purse! An amazing pop of color perfect for the setting! Matches the flowers perfectly :) Super pretty and fun! Hawaii looks ahhh-mazing!!! Love the colors of your cover up! 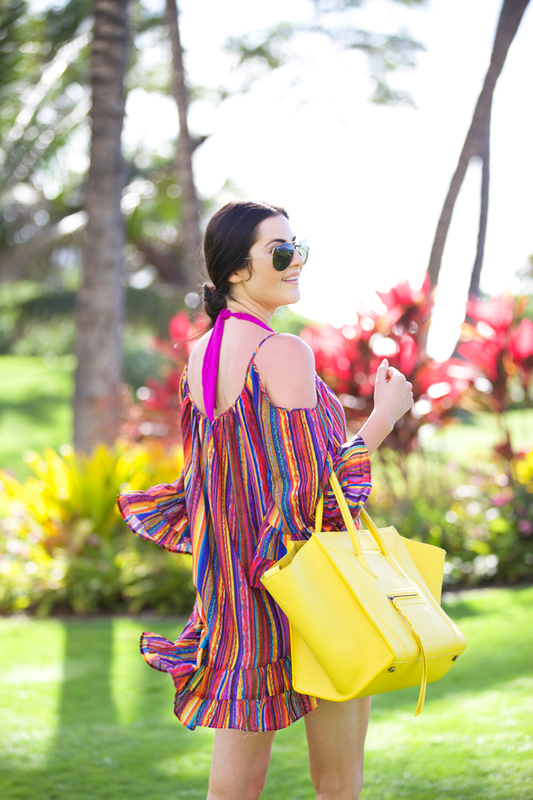 Such a great place to have a family vacation and I am loving all the bright colorful outfits! You look amazing as ever. And such clear and beautiful shots. Love that Isla is with you. She is adorable. Great pictures! I love Hawaii! Hey! What bags do you use for a diaper bag? oooh you almost look like a (better) Kendall Jenner! Love the dress with the open shoulders! You and Isla look so sweet in all these pictures! Looks like you guys are having a blast in Maui! Where is your white dress you wore to dinner one night you had on your snap chat ? You where modeling your legs on that sna.